MASTERPAK, Lebanese polyethylene film manufacturer in Zouk Mosbeh, released its June 2011 issue of the quarterly REACH newsletter. June 2011 MASTERPAK REACH newsletter covers new awards, exclusive distributorships, and sponsored events that took place over the past 3 months. The PE film manufacturer produces agricultural & horticultural films, building & construction films, household plastics & catering films, food & beverage films, tissue & hygiene packaging, industrial films & packaging and soap & detergent films. Executives from INDEVCO Paper Containers will present the masterclass, "Best Practices for Outsourcing from Emerging Middle Eastern Markets", to food and beverage packaging buyers from across Europe. Marwan Diab, Unipak General Manager, and Pierre Akl, INDEVCO Paper Containers Area General Manager, will represent INDEVCO Group, at EuroPack Summit 2011. The annual food and beverage packaging innovation summit will take place from 4-6 July 2011 at Hôtel Majestic Barrière in Cannes, France. Diab and Akl will meet with procurement heads of key food and beverage manufacturing companies across Europe to discuss innovative packaging solutions. The 3-day networking summit recognizes the importance of packaging as a source of communication with customers. Thus, the summit offers leading producers a forum to meet one-on-one with select packaging manufacturers. Members of INDEVCO Paper Containers include Unipak Nile (Egypt), Unipak Hellas (Greece), Unipak (Lebanon), and Easternpak (Saudi Arabia). The corrugated manufacturing plants produce retail ready packaging, shelf ready packaging, point-of-purchase (POP) displays, promotional cartons, and corrugated boxes. EuroPack Summit 2011 will feature presentations on reinventing the innovation model, engineering consumer experiences, real world solutions for packaging sustainability and efficiency in the entire value chain. marcus evans organized the summit in line with its goal to develop global summits and strategic business conferences. The ‘Fake It All’ campaign, developed for Lebanon-based Brand Protection Group, received Cannes Lions Silver PR Award. The Cannes Lions 5th International Festival of Creativity awarded the Silver PR Award for ‘Best Integrated Campaign Led by PR’ to Brand Protection Group’s ‘Fake It All’ PR campaign. The annual global festival took place at the Palais des Festivals et des Congres in Cannes, France from 19-25 June 2011. The ‘Fake it All’ campaign, developed and executed by Leo Burnett Beirut, aims at increasing anti-counterfeit awareness in Lebanon, in line with Brand Protection Group’s mission. INDEVCO Group, founding member of Brand Protection Group (BPG), supports the association’s cause to combat counterfeiting, protect the community from harmful effects of counterfeit products, and preserve the integrity of member brands. Through INDEVCO Group’s active role in the association, the multinational group of companies demonstrates its support to the local community and dedication to promoting Lebanese industry. Cannes Lions PR Silver award coincides with BPG’s continuous efforts to increase awareness of government officials and the general Lebanese public. To spread the campaign message, "The closest things to you can be fake", ‘Fake It All’ was launched using popular media channels, including TV commercials, radio spots, and outdoor billboards, as well as a large attention-grabbing stunt orchestrated on World Anti-Counterfeiting Day (8 June 2011). The stunt was carried out and adapted to various media channels: A mass group of people were sent to a big Lebanese mall to imitate bystanders; a large newspaper agreed to release a fake front page logo for its readers to spot and report; popular TV and radio shows were presented by mock hosts rather than the real hosts; and 250 fake facebook profiles were created sending friend requests to the authentic profiles. Brand Protection Group, an association of local, regional and international producers and distributors, fights counterfeit products in Lebanon and Levant region. The association works closely with the government, diplomatic bodies, and other supporters. BPG communicates to consumers, trade partners and member companies key issues and risks that come with illicit trade. Strategic partners include: Lebanese Ministry of Economy & Trade, customs authorities, Amideast, European Union (EU), French Embassy, UNDP, USAID, and the U.S. Embassy. BPG has received numerous awards for efforts in raising anti-counterfeiting awareness. In 2007, the association received the Global Anti-Counterfeiting Award and in 2008, it was honored with the Golden Pan Arab Web Award in the Non-Governmental Organizations category. Cannes Lions 2011 brought together leaders and professionals in communications and creative thinking. Fifty seven (57) world-class seminars were featured by the Cannes Lions learning program. Lion trophies awarded during the Cannes Lions Festival include Film, Press, Outdoor, Direct, Media Cyber, Radio, Promo & Activation, Titanium and Integrated, Design, PR, Film Craft, and Creative Effectiveness. Unipak Nile completes preparation and ventures into the pilot phase of Al Ghadir World Class Operations Management (WCOM™) system. Egyptian corrugated packaging manufacturer, Unipak Nile, has launched the pilot phase of its WCOM™ system, known as ‘Al-Ghadir’. The plant began implementing Al Ghadir’s lean manufacturing principles in Q1 2011. Al Ghadir’s three phases -preparation, pilot, and expansion- improve company performance; reduce scraps and reworks; ensure smooth process flow; zero defects and breakdowns; balance time between various operations; and manage work in process. During Al Ghadir’s pilot phase, which will last approximately 6 months, Unipak Nile is setting up teams and training them on Total Productive Maintenance (TPM) methodology to apply on machines at the plant. One of the major activities of the pilot phase is initial cleaning. Operators tag machines prior to and following cleaning. Anomaly tags teach operators to notice problems during cleaning and to identify and differentiate problems hidden or caused by dirt. If a problem is flagged prior to cleaning but removed after cleaning, operators deduce that the problem was a result of dirt build-up. However, if a problem persists after cleaning, then operators should find the cause of and solution to the problem. The Al-ghadir methodology focuses on finding countermeasures to problems rather than relying on immediate solutions alone. If the cause of a problem is dirt build-up updating and improving the cleaning standards would be the countermeasure to this build-up. The pilot phase increases machine efficiency, consistent with Al-Ghadir’s goal to reach a smooth stream of operations with zero defects and breakdowns. Unipak Nile managers are demonstrating team support by taking part and assisting operators in tagging machines. INDEVCO Group is of the first signatories of Lebanon Opportunities’ Green Pledge to increase awareness and commitment to social and environmental responsibilities. 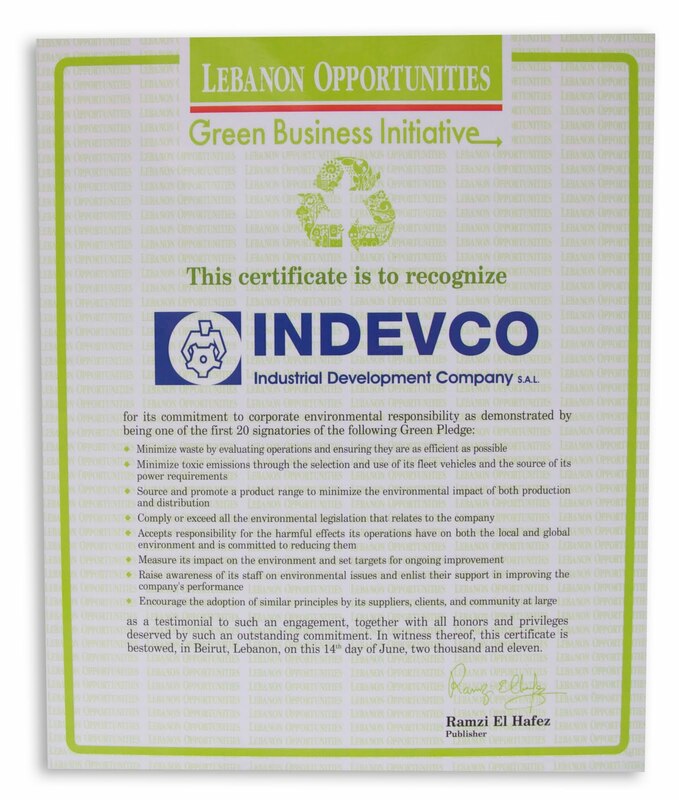 INDEVCO, multinational group of manufacturing companies headquartered in Ajaltoun, Lebanon, received Lebanon Opportunities’ Green Business Initiative certificate for commitment to corporate environmental responsibility during ‘Green Business Opportunities’ conference. As part of Lebanon Opportunities Green Business Initiative, InfoPro Events organized and hosted the Green Business Opportunities conference, of which the Association of Lebanese Industrialists (ALI) is a green partner, on 14 and 15 June 2011 at Mövenpick Hotel and Resort in Beirut, Lebanon. INDEVCO Group’s eagerness and promptness to sign Lebanon Opportunities’ Green Pledge, demonstrates the group’s ironclad commitment to continuously implementing eco-friendly initiatives, adhering to Lebanese environmental legislation, evaluating internal processes and pursuing set targets to improve environmental friendliness. Neemat Frem, President & CEO of INDEVCO Group and President of the Association of Lebanese Industrialists (ALI), partook in the inaugural session of the two-day conference on 14 June. During the ‘Green Energy’ session on 15 June, Imad Issa El Khoury, Area General Manager of Unipak Tissue Mill and Interstate Paper Industries, presented the case study, 'Unipak Tissue Mill Energy and Cost Reduction Success Story'. Furthermore, Issa El Khoury discussed Unipak Tissue Mill's environmental initiatives implemented starting 2009. Unipak Tissue Mill has invested in over 30 large green projects leading to a 24 % reduction in energy consumption and will implement many more eco-friendly initiatives in the near future. Unipak Tissue Mill in Halat, Lebanon, and Interstate Paper Industries, in Sadat City, Egypt, are member companies of INDEVCO Group and manufacture virgin and recycled jumbo tissue rolls. Speakers at the inaugural session included Antoine Dahdah from Holy Spirit University of Kaslik (USEK) about a holistic green approach, Ziad Jaber from United Nations Economic and Social Commission for Western Area (ESCWA) about opportunities in low-carbon development, and Abdo Sweidan from RYMCO presenting a case study about carbon neutral. Other speakers at the conference discussed available financial support systems for green projects, innovative green marketing campaigns, green construction projects, hotels and restaurants that have gone green, how to save energy and available tools to audit consumption, and practical green tips that can be implemented in offices.